What do “those decadent Europeans” understand? Andrew Sullivan concluded his most recent post on emergency health care with two questions. In what field of human activity is a free market system consistently far less efficient than a socialized one? 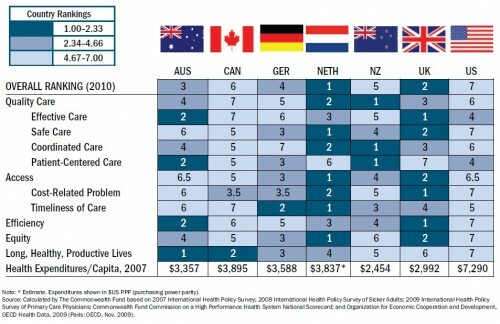 Why are those decadent Europeans actually more efficient in providing healthcare than we are? Any field for which there are severe market failures — health care being one — is one for which a socialized approach has the potential to help. “Those decadent Europeans” seem to understand this. Moreover, international comparisons are consistent with the hypothesis that a more socialized approach does, in fact, help. Not the same set of countries, I know, but there is some overlap. However, the story is the same no matter what set of rich, industrialized countries you choose. 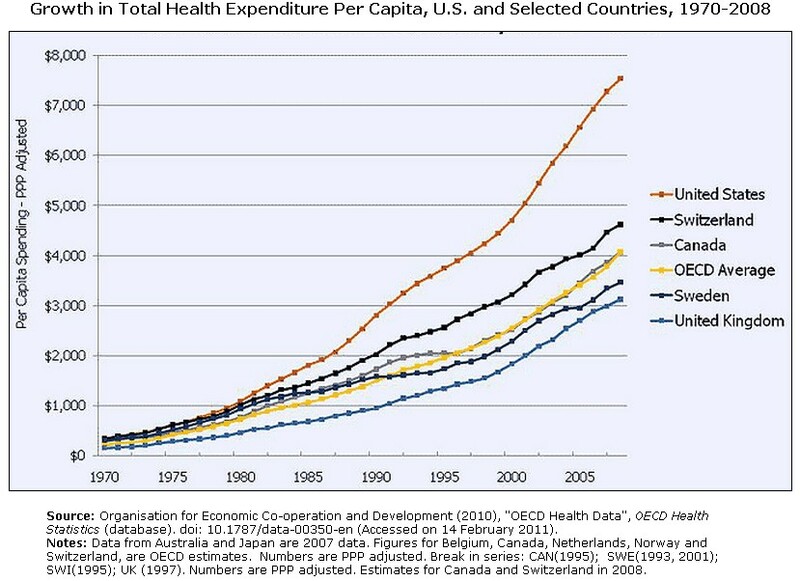 The US spends vastly more (even controlling for wealth), that spending is tilted more heavily toward private spending than is that of other OECD nations, and nearly all US population health outcomes are nowhere near the top of the heap. 1. Keep in mind that we do have socialized schooling in the USA and we still spend way more on schooling and by some the measures get worse outcomes. Note I think that USA educational outcomes are as good any country’s but I am in the minority and we pay high price for those outcomes. 2. The market failures in healthcare are not noticeably worse in health than in other areas. Certainly there are good externalities in the area of infectious disease and emergency care has market problems but these 2 areas combined are a small part of healthcare spending. What exactly do you mean by “socialized schooling”? We do not have single payer federal schooling, it’s a checkerboard of states deciding that school is mandatory and providing education if you can’t afford private school. Can you imagine what the state of basic education would be like if it was like the insurance industry? Hell yes, socialize schooling. One more this since outcomes vary by ethnic group (for example Hispanic american live longer that the non-Hispanic whites despite being poorer) is impossible to say whether or not USA medical care produces superior outcome or not. Our system surely can be compared to others. The point is to provide health care. You’ve merely illustrated why our system might be poor at it. I second the concept that you simply cannot take the population of the entire U.S. and compare it to the population of another country with regards to health. How on earth does the population of Canada match up with the population of the U.S., both demographically and genetically? Adjusting for income does not solve this issue. While I don’t discount that government control of the entire healthcare system would reduce costs, I seriously doubt that outcomes would improve at all. So to continously cite outcomes to drive towards a more socialized system is foolish. I think the proper way to look at this is to notice how much of an outlier the U.S. is and consider the main difference between us and everyone else. That difference is our privatized health insurance system. We pay way more and get outcomes that are somewhere between on par and slightly below the rest of the 1st world while also leaving 15% or so uninsured. Our population is not different enough from Canada or other countries to explain paying about 70% more for not even universal health care. The only explanation is that socialization would improve efficiency. Improvements in outcomes are debatable, but I imagine simply insuring more people would have to help some. I think Tiffany unwittingly makes the point. In a private health insurance system there is little incentive to control costs as consumers have very few chances to shop, especially in the expensive cases, where they are at the mercy of unquestioned doctors, who get paid more for doing more. This is the colossal market failure that drives up our prices and it is repeated constantly. There is no private market solution to this or the U.S. insurance industry, populated by avowed capitalists, would have found it by now. Bring on the socialism! If you like to have more money, there is no disagreeing. There are of course many market mechanisms that could be employed to help control costs. First and foremost is forcing people to pay more, directly, for their doctors’ visits and their prescriptions via co-pays. $10 co-pays for $200 visits are ridiculous. Let’s rescind or at least reduce the tax break for employer-provided healthcare coverage, and let’s find a way to extend that to the individual instead with a focus on cost (e.g. maybe the Feds could produce a list each year of all the private insurance programs they feel are most cost effective, and give people a tax credit for purchasing those individually.) Reform licensing requirements so more medical practitioners of all qualifications can perform more services; one of the reasons the U.K. is cheaper is that a lot of their healthcare is performed by nurses. Similarly, find a way to get the supply of doctors up. Increase competition in medical technology and pharmaceuticals by reducing the regulatory hurdles for new device and drug approval. Stop the “comprehensive coverage” nonsense that subsidizes everything from coronary stents to the chiropractor and get people onto high-deductible plans. Those are just a few ideas; some may work, some may have been tried and failed. Still my original point stands. I do not doubt that if the healthcare system was completely socialized and operated by the government, things might cost less. I do doubt, wholeheartedly, that less people will have heart attacks, cancer, broken bones, or the flu because Uncle Sam pays your doctor bill. Why aren’t $200 visits ridiculous? In respect of the things you can get in the US vs say UK (my country), it seems you can get a lot of tests with little evidence base but help when you are unreasonably sued and higher cost and drugs with nicer packaging that are just as effective as the chaper Indian ones. 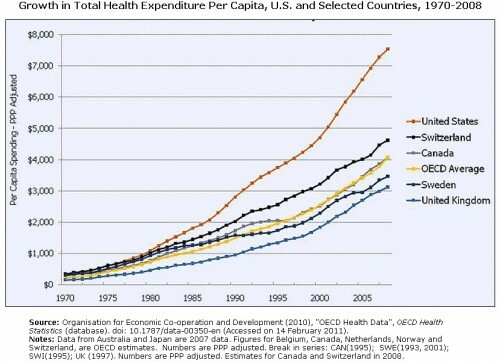 Health is a command economy, and at present in the US the drug companiess command the purse of the not so well off. Social aka cooperative provision is obviously a sore point for some in the US but why? Who would, for example, NOT socialise defense?